Surprised I’m reviewing this movie? I’ll watch anything starring Daniel Day-Lewis. It’s really that simple. 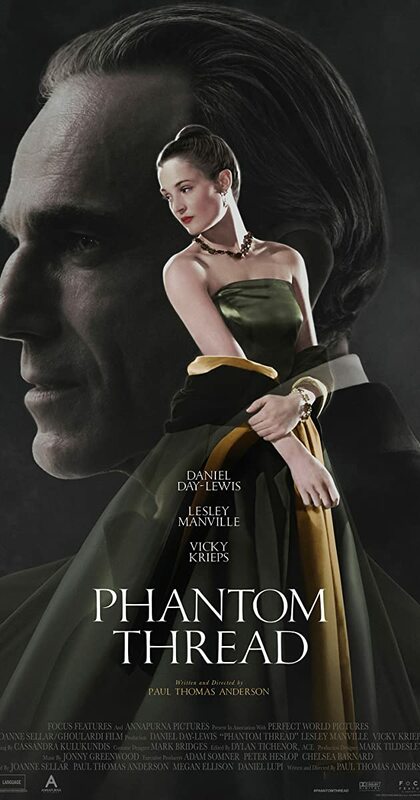 My wife and I have not been together to see a movie in quite some time, so we figured Phantom Thread would be a nice “date” movie for us to enjoy. In the end, I’m not sure we “enjoyed” it, but we definitely “appreciated” it. Let’s get this out of the way — Phantom Thread is not a “date” movie. I wouldn’t even consider it a “mainstream” movie. It’s very slow, very quiet, very long, and very understated … until it’s not. More on that in a minute. I’d also like to say upfront that, had we watched this at home, my wife probably would have fallen asleep and I would then probably have turned it off. I’m glad we saw it in the theater because that guaranteed we’d give it our full attention. We were fully engaged and fascinated the whole time, even if we did occasionally check the time. If you’re unfamiliar with the plot, Daniel Day-Lewis plays a fussy dressmaker in the 1950s. He is something of a mastermind and his house (brand) is always in demand. However, he is obsessed with his work, and he will not tolerate anything or anyone that detracts him from his life’s meaning. He soon falls for a waitress while on holiday. He brings her back with him and then the meat of the story really begins. He wants to continue life as it was before her–she’s supposed to just slide right into his established patterns. But she wants to love him on her terms, not his. Both are headstrong, sharp-tongued, and repressed … until they’re not. I don’t want to say more because it will spoil a rather interesting development regarding their dynamic. So, getting back to the thing I said about appreciating it but not necessarily enjoying it. Watching Daniel Day-Lewis transform himself into this man proved amazing. His character, Reynolds Woodcock, is contradiction personified. He is so calm and collected until he loses his temper. He is tough and cold until he’s an emotional mess. He’s calculated and intelligent until he spouts angry gibberish. He’s polite and sophisticated until he acts like a spoiled child. He’s independent and self-reliant until he admits to being a mamma’s boy. Day-Lewis delivered this character without apparent effort making him simultaneously believable, charming, and detestable. As is often the case with Day-Lewis, I did not see the actor during the film, I saw only Reynolds Woodcock. I believe this movie had a lot to say about relationships as well. I think many of us can relate to the honeymoon phase of a relationship and then the unavoidable humdrum of routine and monotony. His love interest, Alma, refused to fall into Reynolds’ regimen. As I said earlier, she loved him, but she demanded to love him on her own terms, in her own way. Again, I won’t spoil the actions she takes to make him completely hers, but it’s unexpected to say the least. His ultimate reaction to her extreme behavior is something I would love to speak to you about privately. I won’t write about it here, of course, out of respect to those who haven’t see it yet. Needless to say, my wife and I had much to discuss during the drive home. In the end, I found Phantom Thread refreshing. I don’t think a single special effect appeared in the entire movie. The score rarely rose above the sound of a piano tapping. This movie excelled purely due to story, production, dialogue, and performance. While I wouldn’t recommend Phantom Thread as a date movie, I would definitely recommend it for those wanting a change from capes and laser swords. I’m no film aficionado, but even I recognized the sheer mastery of craft unfolding before my eyes. Phantom Thread is absolutely worthy of your appreciation.